Anyone can hire a minority – which, yes, in and of itself is a good thing – but it’s how you treat them that determines your true value as an employer. 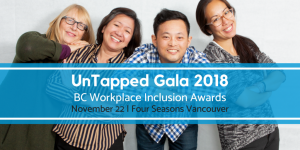 I’ve boasted about my employers since the moment they hired me, and on November 22nd at the UnTapped Gala 2018 BC Workplace Inclusion Awards, Murphy Battista LLP was officially recognized for their excellence. Murphy Battista is the winner in the small business category, and I’m so thrilled that the community has agreed. Seven years ago I was drowning. Badly. It was probably one of the darkest points of my life. I was three years injured and trying to get back into the workforce. Money and disability are not close friends. The Persons With Disability (PWD) allowance is poor at best, and not nearly enough to cover the cost of living in Vancouver. ICBC had deemed me fit enough to return to work, and so I lost my wage benefits through them. I was living in this crappy little basement suite that I was so embarrassed by, I refused to even order delivery because I didn’t want anyone to know where I lived. I was allowed to do one single load of laundry a week, and there was no heating, so that winter was very cold. I managed to find a job and I was hired by a big company in their call centre. I won’t name names, but I’m certain they appreciated all my minority checkpoints. I’m a single, disabled, native, female. Check, check, check, check – now they can feel good about being inclusive employers, right? They may have enjoyed the minority check-points I gave them, patting themselves on the back for being inclusive, but they did not in any way respect or accommodate my disability. I was treated as an able-bodied person and given zero allowance for my disability. I find mornings are the most difficult, and I’m prone to pain flare-ups that debilitate me entirely. This company had me working 7am-1pm, and refused to change my shift. And if I was ever in too much pain for work I was required to get a doctors note and was only allowed approximately 3 of these ‘offences’ before being disciplined. I explained numerous times about my disability, but no one cared. Policy was policy, and I was under constant threat of being fired. They espoused inclusion of people with disabilities, but I think I was hired for my minority checkpoints, with them giving no care or consideration to what those points would mean in the workplace. They simply didn’t care that I had a disability and that I couldn’t work the same as an able-bodied employee. And so I was drowning. I simply am not physically capable of that kind of workload because of my disability. But they made me feel inadequate and useless with their expectation that I work within those parameters. My work life was killing me physically, and my home environment was no respite. I was ready to call it quits, entirely, because I simply couldn’t live like that. It was no life. This may sound a little dramatic but it is the truth – in many ways, they literally saved my life. They offered me a job to work in their resource centre and saved me from the hell I was in. Murphy Battista is dedicated to helping people with disabilities “get their life back”. This is proven not only in their excellence as a boutique law firm, representing only the victims of accidents but in their charitable contributions to things like wheelchair hockey and wheelchair curling (among many other things). In terms of demonstrating leadership in diverse and inclusive hiring and engagement practices, Murphy Battista opened up a Personal Injury Resource Centre in 2012 dedicated to helping people with disabilities for free and is staffed entirely by people with disabilities. But what I feel is most important is how they treat me here at Murphy Battista. If I have a pain flare-up, I am compassionately told to leave early or stay home with no ridiculous ask for a doctors note – they respect that forcing me into a doctors office is not only a waste of time, it’s completely counterproductive and dangerous in forcing me to move and travel in that condition. I’m given autonomy on my hours and can start when I am able. This, quite wonderfully, has allowed me to work more hours than at the Bad Place, because I can work when I’m able, I don’t stress or push beyond my means which means better pacing and more energy – and because they’re so good to me, I’m excited to work as much as physically possible for them. Because of this understanding, I feel like a competent and integral part of this firm. I am dedicated and work hard because the respect is mutual. I now can afford to live in a home that I love, (and that has heat). I am no longer on financial assistance and am not starving. I now look forward to going to work and do my best to show them every day how much I appreciate their kindness. They are simply THE BEST employers a disabled person like me could ask for. They are incredibly understanding of our limitations and abilities, allowing us the freedom to work the best of our capabilities. All of our needs are met swiftly and with a compassion born from an understanding that is unique to the perspective of someone who deals with mild to catastrophic injuries on a daily basis. No one knows better the pain and suffering, and also the strength and resilience, of someone dealing with an injury and disability like a dedicated personal injury lawyer (well, I mean, aside from the injured themselves. But you know what I mean!). I may have been hired me in part because I have a disability and great customer service skills, and so I have a unique perspective and ability to work in an office that helps people with disabilities, but where Murphy Battista shines is in their incredible respect and understanding of their employees needs, including the unique and often demanding ones of a person with a disability. Anyone can hire a minority, it’s how you treat them that determines your value as an employer. Murphy Battista really excels when it comes to inclusion. Not only is their Resource Centre employed entirely by peoples with disabilities, but they respect and accommodate us willingly and happily, allowing us to work to our fullest potential. And I don’t think I even got to mention that all the offices are staffed by many minorities, including people of colour, women, etc. And these people aren’t in menial positions, these are integral members of the firm. Scott Stanley wrote to me once, “We really just hire the best people and don’t really think about inclusion.” – which is exactly why the workplace is so inclusive; the concept of discrimination doesn’t exist here. A person’s value is determined based on their skillset and any limitations are cared for and accommodated, allowing the maximum effort to shine from every employee. Because of Murphy Battista, I and my fellow disabled co-workers have been gainfully employed for 6 years, and they’ve made it clear that they care about us, our health, and our future. I was given my freedom and independence back when I was hired by MB. And I am able to help other people with disabilities which gives me a sense of accomplishment and happiness. Because MB chose to open this Resource Centre and hire people with disabilities, it’s made a lasting impact on us, and to the community that we are able to help. Thank you Open Door Group for giving them the recognition they deserve! If you’d like to listen to my acceptance speech on behalf of Murphy Battista, please visit their Facebook page.